Falmouth born and bred Nick started cooking when he was fifteen years old, then trained under chef legends Keith Floyd and Jean Christophe Novelli. He returned to Cornwall to run restaurants at the Headland Hotel and The Rosevine, as well as to teach at Jamie Oliver’s Fifteen Foundation. 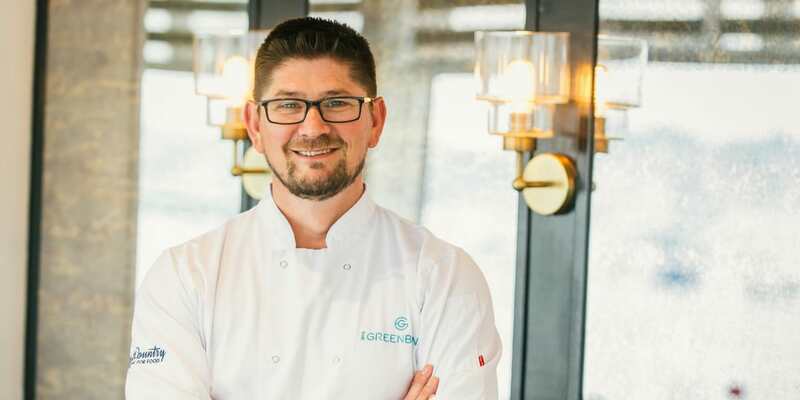 Now forty six, most of the chefs he trained with have long left the profession, whereas Nick has grown to become Executive Chef of both The Greenbank Hotel in Falmouth and The Alverton Hotel in Truro. With a love of food and the outdoors, the two always sat side by side. Nick loves to catch the fish, then cook it and of course, eat it too! Nick believes that The Greenbank is refreshing. It’s honest and it concentrates on what he does best. Sat on the river with views of the Carrick Roads and beyond, Nick understands that our guests want to taste the view and it’s his job to do his best to deliver this. With a food style of modern, regionally influenced food with a rustic edge, Nick has really put his style of cooking out there for Cornwall to taste. Where is your favourite place to eat in Cornwall? Anywhere I don’t have to cook! I grew up in Falmouth and have a serious passion for local produce. Normally we eat out during the spring and summer season. I always head for al fresco – you can’t beat a local catch of the day whilst looking out over the water. What’s your favourite location for walks? I’ve just done Snowdonia which was amazing, but my heart will always be in Cornwall. I love the cliff walks around the Helford and exploring all of its secret creeks, sub-tropical gardens and ancient forests. And there are plenty of waterside pubs to find along the way! What is the best Cornish delicacy? A fresh crab sandwich on a granary doorstep, with lots of butter. Or a lazy breakfast of poached eggs on toast with good coffee in the garden. My top food tip would be to let the produce stand out – season it well, complement with subtle flavours, and don’t rush. Where’s the best place to tuck into some food and enjoy a beer or two? I am biased but The Working Boat at the hotel has an incredible atmosphere and views to match. Established in 1876, it was traditionally the first port of call for those on the working boats after a hard day out at sea. It is a great spot for a casual Sunday roast or pint of our own ‘Working Boat’ beer. I remember the pub from my childhood – jumping off the quay and then tucking into some hearty food. Now it’s my children jumping off the quay and I aim to bring back those good old fashioned family values. Where’s your favourite secret place to explore? If I said it wouldn’t be a secret! But I get there by kayak. I’m from Falmouth and The Greenbank is special to me. It’s always been the dream to cook here and I wouldn’t work for any other hotel at this point in my career. You’ll find all the quality and flavours you’d expect from a fine dining experience, but more relaxed and rustic…not pretentious or fussy. Our menus have been designed around top notch ingredients from local suppliers. The classics will stay, but in celebration of the produce available right on The Greenbank’s doorstep, we also champion local fresh fish.